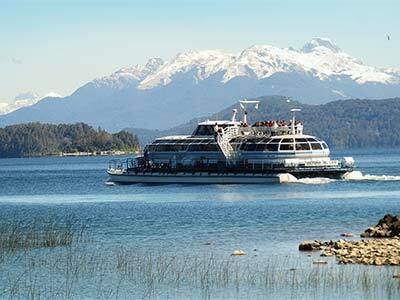 Puerto Blest and Cantaros Falls Tour takes you from the meeting point in Bariloche to Puerto Panuelo, where you'll board a catamaran and sail along Lake Nahuel Huapi. After arriving at Puerto Cantaros, you will hike along a short path to reach Cantaros Lake, from where you can admire the beauty of the waterfalls that slide over the rocks. Then you will return to the catamaran to reach Puerto Blest for lunch. Optionally you can visit Lake Felix Frias to reach Puerto Frias, where you can enjoy panoramic views of Tronador volcano and its glaciers. Finally you'll return to Puerto Blest, where you'll board the catamaran to reach Puerto Panuelo, where you'll take the shuttle that will take you to downtown Bariloche.